INCHEON, Oct. 11 (Yonhap) -- Golf is a notoriously fickle game. Today's stars may not be stars tomorrow. Some will burn out and others will fade away. It may be harsh to call Lydia Ko, still just 21, a has-been on the LPGA Tour, though it certainly seems that way. After sweeping up 12 LPGA titles from 2014 to 2016, Ko, a South Korean-born Kiwi, went winless in 2017 in 26 starts. Ko does have a win in 2018, along with six other top-10 finishes in 21 events. But she has slipped from No. 9 in the world rankings at the start of the year to No. 17 this week. Other 20-something stars with powerful games, such as Park Sung-hyun of South Korea and Ariya Jutanugarn of Thailand, have stolen Ko's thunder. But Ko said her confidence in her game hasn't wavered. And she's trying to use her late season appearances in South Korea to turn her game around. Ko shot a two-under 70 to open the LPGA KEB Hana Bank Championship at Sky 72 Golf Club's Ocean Course in Incheon, just west of Seoul, on Thursday. The round included a chip-in eagle at the par-four 15th, and she was one of just 20 players among 78 to go under par on the chilly and blustery day. 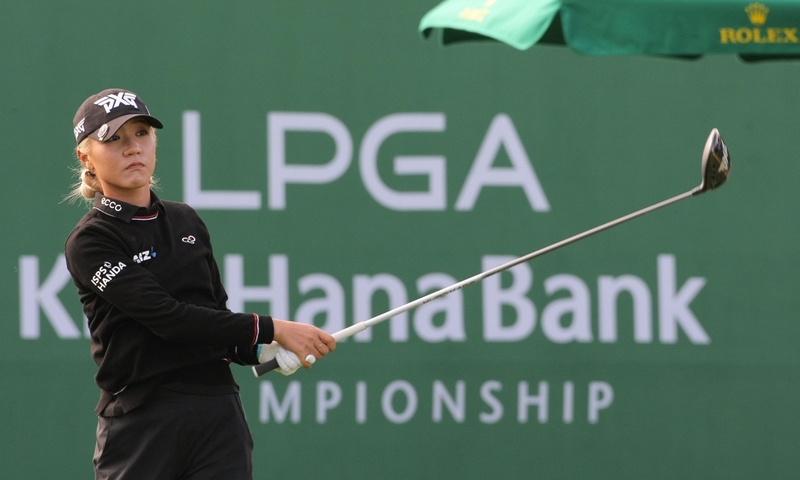 "It was pretty windy out there, and I thought the conditions were harder than what the scores are, and it just shows the girls are playing well," Ko told Yonhap News Agency after her round. "It's nice to start off with an under-par round." At 275 yards, the 15th hole is a drivable par-four. Ko said she tried to be more aggressive one that hole and she was fortunate to get "a decent lie" on the right rough. This is Ko's second-straight tournament appearance in her native country. Last week, Ko played at a Korea LPGA (KLPGA) major, Hite-Jinro Championship. After barely making the cut at nine-over, Ko finished strong with a 68 in the final round and ended up tying for 19th. "It was a great experience and a cool opportunity," she said. "It's not very often I get to play two weeks in Korea. I am trying to enjoy these two weeks." Ko sits five strokes behind the leader, Nasa Hataoka of Japan, at the KEB Hana Bank Championship. The leader's margin is far from insurmountable, given the typically windy conditions and, yes, the fickle nature of golf. Even in her winless 2017 season, Ko posted three runner-ups and had a strong finish, with two top-5s in her last four tournaments. "I knew I was close, and I knew there were things in my game that I needed to work on," she said. "Obviously, winning at (LPGA Mediheal Championship in April) was a huge confidence boost. It proved that I can do it. It's more about putting yourself in contention and in good position, and you can gain confidence."